Almost to the day two hundred years ago, Adolphe Sax was born in Dinant, Belgium. He created many new instruments, including what we now know as the saxophone, but also this strange hybrid, the saxhorn, a six valve horn of which the valves could only be used independently. The instrument never got any success. The second tune, "Travel Stain", brings a duet between the tuba and a classical guitar, played by Seth Josel, continuing the stretched tones, yet with more changes of pitch, entering into a calm, more intimate yet intense dialgue with the strings. Josel's playing is minimal to say the least, plucking slow chords or single strings, sprinkled around the saxhorn's volume, gradually coming more to the foreground, shortening the tones to little droplets of sound. The longest track lasts half an hour, and is a magnificent tribute to the deep reverberating sound of the instrument. No more layers of tone here, but the naked power of one instrument, almost organically growing out of the surrounding silence. It sounds like something fundamental, like the primal rumbling of the earth or the universe, the basic sound that lies below it all, and that now, for once, is coming to the surface, within our limited auditory range, as a special treat. And hearing that, even for half an hour, is very short, yet then for the last few minutes the tone shifts to very high, almost angelic multiphonics, adding an entirely new dimension to this magnificent piece. 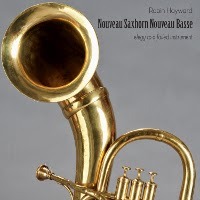 Regardless how strange Adolphe Sax's original instrument, or how unusual Hayward's own custom-made valve tuba, the result is fabulous: a great tribute to musical instruments, their power and the sounds they can bring us.